Synthetic peptide within Human ECH1 aa 300 to the C-terminus (C terminal). The exact sequence is proprietary. Human fetal liver, A549, Jurkat and HeLa lysates; Human endometrium and kidney tissues; MCF-7 cells; Jurkat cells. Our Abpromise guarantee covers the use of ab189255 in the following tested applications. WB 1/10000 - 1/50000. Detects a band of approximately 33 kDa (predicted molecular weight: 36 kDa). 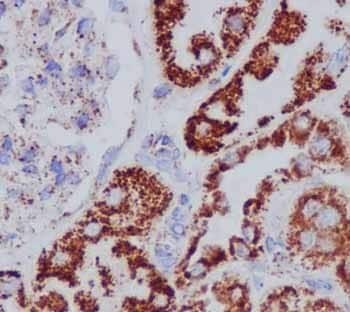 Perform heat mediated antigen retrieval with EDTA buffer pH 9.0 before commencing with IHC staining protocol. 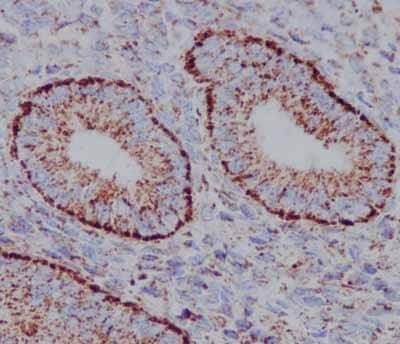 Immunhistochemical analysis of paraffin-embedded human endometrium tissue labeling ECH1 with ab189254 at 1/500 dilution, followed by prediluted HRP Polymer for Rabbit IgG. Counter stained with Hematoxylin. 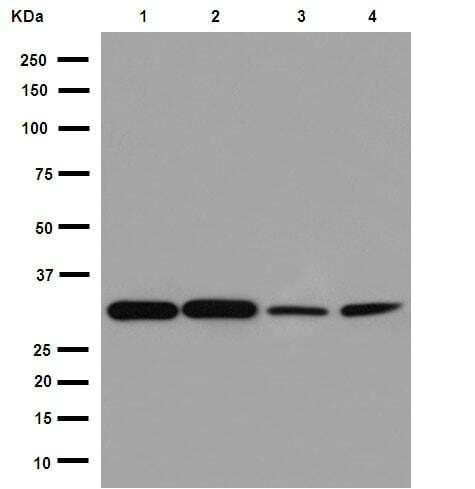 Immunhistochemical analysis of paraffin-embedded human kidney tissue labeling ECH1 with ab189254 at 1/500 dilution, followed by prediluted HRP Polymer for Rabbit IgG. Counter stained with Hematoxylin. 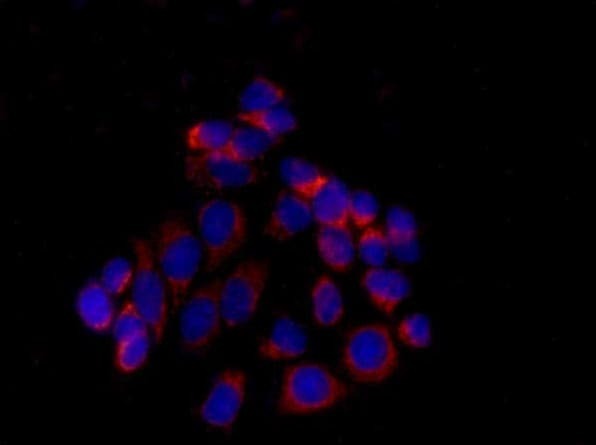 Immunfluorescent analysis of 100% methanol(-20℃)-fixed MCF-7 cells labeling ECH1 with ab189254 at 1/250 dilution, followed by Goat anti rabbit IgG (Alexa Fluor® 555) secondary antibody at 1/200 dilution. Counter stained with DAPI. Flow cytometric analysis of 2% paraformaldehyde-fixed Jurkat cells labeling ECH1 with ab189255 at 1/20 dilution (red) compared to a Rabbit monoclonal IgG isotype control (green), followed by Goat anti rabbit IgG (FITC) secondary antibody at 1/150 dilution. 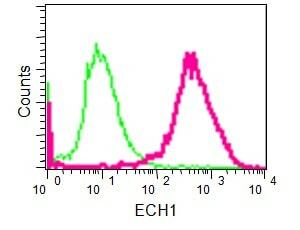 Western blot analysis of ECH1 in human fetal liver lysate immunoprecipitated using ab189254 at 1/50 dilution. 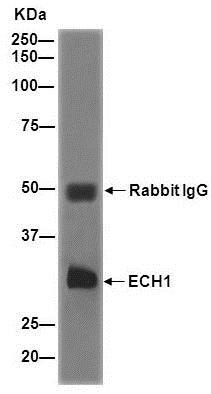 Secondary antibody: Goat Anti-Rabbit IgG, (H+L), Peroxidase conjugate at 1/1000 dilution. ab189255 has not yet been referenced specifically in any publications. Publishing research using ab189255? Please let us know so that we can cite the reference in this datasheet. There are currently no Customer reviews or Questions for ab189255.